To try to talk about the history of Poland in a single paragraph would be a haphazard approach and an evidence of superficiality. Few countries have known such status fluctuations in the modern era and the contemporary, from the one of high power (during the union with the Grand Duchy of Lithuania stretched from the Baltic almost to the Black Sea) to the inexistence as state, at the end of the 18th century being partitioned between Prussia, Russia and Austria. In fact raising and collapse characterizes it, as well as the verticality of the attitude. As an example the Warsaw Uprising from the autumn of 1944 is undoubtedly one of the most heroic acts in WWII, even if the enormous sacrifices of the insurgents had no other result than the Soviets advance facility, which will keep Poland in their area of influence until the late '80s. Can't talk about the history of Poland without talking about Kraków, a city situated in Lesser Poland (Małopolska), on the Vistula River, at the foot of Wawel Hill. It’s not known when it was founded, but in 965 a merchant from Cordoba wrote about it as the bustling trade center of Slavonic Europe. Its northern neighbors of the Piasts’ dynasty incorporated the Kraków province into their principality in the 990s, and thus was born the Kingdom of Poland. In the year 1000 the city had its own bishop, and in 1038 it became Poland’s capital, and its Wawel Castle the residence of Polish kings, but the city’s Golden Age came at the end of the 15th century. For its outstanding medieval architecture, the Historic Centre of Kraków, based on four core areas (the market square; the Wawel hill, inhabited since the Palaeolithic and the site of the imperial palace; the urban district of Kazimierz; and the Stradom quarter), is among the first sites chosen for the UNESCO's original World Heritage List, in 1978. 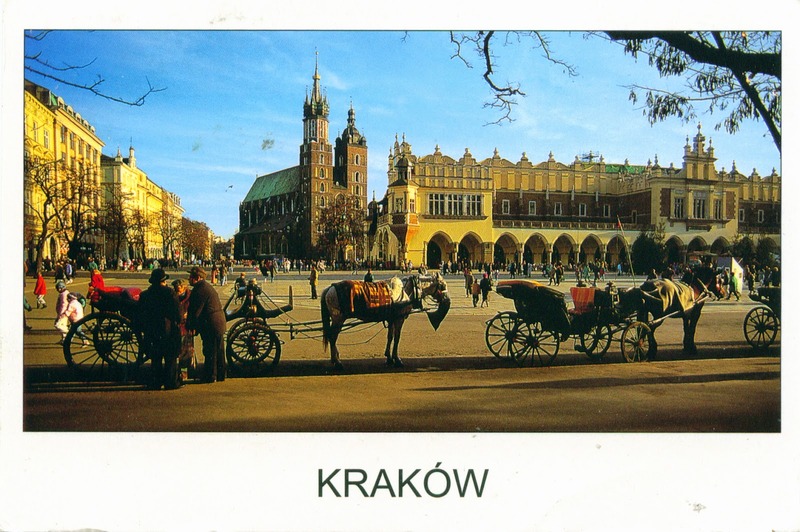 The Main Square (Rynek Główny - shown in the first postcard) dates back to the 13th century, and is the largest medieval town square in Europe. It is surrounded by old brick buildings (kamienice), palaces and churches, its center being dominated by the Sukiennice (the Cloth Hall or Drapers' Hall - in the first postcard, in right), rebuilt in 1555 in the Renaissance style. On one side of the Sukiennice is the Town Hall Tower (Wieża ratuszowa), on the other the 10th century Church of St. Wojciech (St. Adalbert's) and 1898 Adam Mickiewicz Monument. Rising above the square are the Gothic towers of St. Mary's Basilica (Kościół Mariacki - shown in the first postcard, in center, but also in the second). The Church of Our Lady Assumed into Heaven is the most famous of all Poland's churches. The present Gothic edifice replaced its Romanesque predecessor at the end of the 13th century. In 1365 a chancel was added and soon its splendid big stained-glass windows, of which three are still in place, were ready as well. The taller of its two towers (81m), with a fantastic Gothic spire of 1478 and a gold-plated crown of 1666, belongs to the municipality and the Kraków signal (Hejnał mariacki) is played from it every full hour. The lower tower (69m), with the 1592 Renaissance roof, accommodates five bells, two of them dating back to the late 14th century. Inside the east wall of the chancel is an altar carved by Wit Stwosz between 1477 and 1489, the largest piece of mediaeval art of its kind (about 13m high and 11m wide). 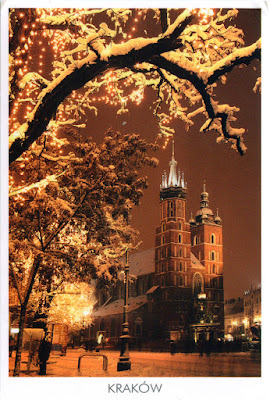 According to the legend, Kraków's residents asked two brothers to build the two towers of the church. It soon turned out that the younger one was not as masterful as the other, and his tower was growing much slower. Envious of his brother's success, he killed him with a knife. Having realized what he had done, the young brother climbed on the high tower and threw himself from one of the windows. The knife with which he committed the crime can still be seen hanging above one of the doors of Sukiennice. 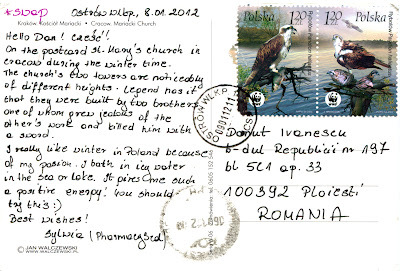 The stamp, depicting Czestochowa - Convent of Jasna Gora (2,40 PLN), is part of the definitive series named Polish Cities, about which I wrote here. 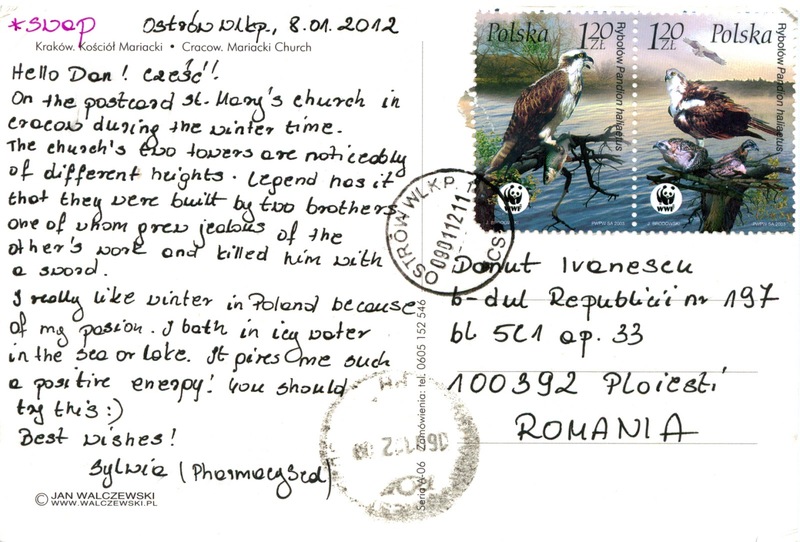 The two stamps, depicting the osprey (Pandion haliaetus), complete the series about which I wrote here. This is beautiful city. 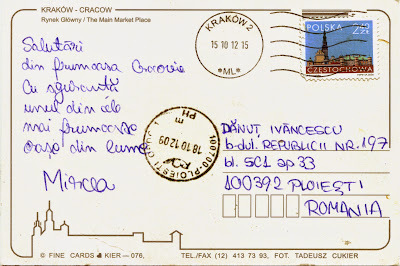 I study in Cracow.